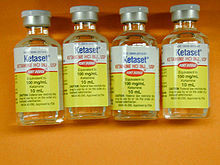 Ketamine, one of the most common NMDA receptor antagonists. NMDA receptor antagonists are a class of anesthetics that work to antagonize, or inhibit the action of, the N-Methyl-D-aspartate receptor (NMDAR). They are used as anesthetics for animals and humans; the state of anesthesia they induce is referred to as dissociative anesthesia. Several synthetic opioids function additionally as NMDAR-antagonists, such as pethidine, levorphanol, methadone, dextropropoxyphene, tramadol and ketobemidone. NMDA receptor antagonists induce a state called dissociative anesthesia, marked by catalepsy, amnesia, and analgesia. Ketamine is a favored anesthetic for emergency patients with unknown medical history and in the treatment of burn victims because it depresses breathing and circulation less than other anesthetics. Dextrorphan, a metabolite of dextromethorphan (one of the most commonly used cough suppressants in the world), is known to be an NMDA receptor antagonist. Depressed NMDA receptor function is associated with an array of negative symptoms. For example, NMDA receptor hypofunction that occurs as the brain ages may be partially responsible for memory deficits associated with aging. Schizophrenia may also have to do with irregular NMDA receptor function (the glutamate hypothesis of schizophrenia). Increased levels of another NMDA antagonist, kynurenic acid, may aggravate the symptoms of schizophrenia, according to the “kynurenic hypothesis”. NMDA receptor antagonists can mimic these problems; they sometimes induce “psychotomimetic” side effects, symptoms resembling psychosis. Such side effects caused by NMDA receptor inhibitors include hallucinations, paranoid delusions, confusion, difficulty concentrating, agitation, alterations in mood, nightmares, catatonia, ataxia, anesthesia, and learning and memory deficits. Because of these psychotomimetic effects, NMDA receptor antagonists, especially phencyclidine, ketamine, and dextromethorphan, are used as recreational drugs. At subanesthetic doses, these drugs have mild stimulant effects and, at higher doses, begin inducing dissociation and hallucinations, though these effects and the strength thereof vary from drug to drug. Most NMDA receptor antagonists are metabolized in the liver. Frequent administration of most NMDA receptor antagonists can lead to tolerance, whereby the liver will more quickly eliminate NMDA receptor antagonists from the bloodstream. NMDA receptor antagonist are also under investigation as antidepressants. Although NMDA antagonists were once thought to reliably cause neurotoxicity in humans in the form of Olney’s lesions, recent research suggests otherwise. Olney’s lesions involve mass vacuolization of neurons observed in rodents. However, many suggest that this is not a valid model of human use, and studies conducted on primates have shown that use must be heavy and chronic to cause neurotoxicity. A 2009 review found no evidence of ketamine-induced neuron death in humans. However, temporary and permanent cognitive impairments have been shown to occur in long-term or heavy human users of the NMDA antagonists PCP and ketamine. A large-scale, longitudinal study found that current frequent ketamine users have modest cognitive deficits, while infrequent or former heavy users do not. Many drugs have been found that lessen the risk of neurotoxicity from NMDA receptor antagonists. Centrally acting alpha 2 agonists such as clonidine and guanfacine are thought to most directly target the etiology of NMDA neurotoxicity. Other drugs acting on various neurotransmitter systems known to inhibit NMDA antagonist neurotoxicity include: anticholinergics, diazepam, barbiturates, ethanol, 5-HT2A serotonin receptor agonists, and muscimol. Since NMDA receptor overactivation is implicated in excitotoxicity, NMDA receptor antagonists have held much promise for the treatment of conditions that involve excitotoxicity, including benzodiazepine withdrawal, traumatic brain injury, stroke, and neurodegenerative diseases such as Alzheimer’s, Parkinson’s, and Huntington’s. This is counterbalanced by the risk of developing Olney’s lesions, which have only ever been observed in rodents, and studies have started to find agents that prevent this neurotoxicity. Most clinical trials involving NMDA receptor antagonists have failed due to unwanted side effects of the drugs; since the receptors also play an important role in normal glutamatergic neurotransmission, blocking them causes side-effects. These results have not yet been reproduced in humans, however. Mild NMDA receptor antagonists like amitriptyline have been found to be helpful in benzodiazepine withdrawal. Simplified model of NMDAR activation and various types of NMDAR blockers. Chemicals that deactivate the NMDA receptor are called antagonists. NMDAR antagonists fall into four categories: Competitive antagonists, which bind to and block the binding site of the neurotransmitter glutamate; glycine antagonists, which bind to and block the glycine site; noncompetitive antagonists, which inhibit NMDARs by binding to allosteric sites; and uncompetitive antagonists, which block the ion channel by binding to a site within it. Selfotel: an anxiolytic, anticonvulsant but with possible neurotoxic effects. Amantadine: used for treating Parkinson’s disease and influenza and Alzheimer’s. Atomoxetine: a norepinephrine reuptake inhibitor used in the treatment of ADHD. Agmatine: Blocks NMDA receptors and other cation ligand-gated channels. Can also potentiate opioid analgesia. Dextrallorphan: a more potent analogue of dextromethorphan. Dextromethorphan: a common antitussive found in cough medicines. Dextrorphan: active metabolite of dextromethorphan. Diphenidine: a novel designer drug sold on the internet. Dizocilpine (MK-801): an experimental drug used in scientific research. Ethanol: also known as alcohol, a widely used legal intoxicant. Eticyclidine: a slightly more potent dissociative anesthetic than phencyclidine but with greater nausea/unpleasant taste, that was discontinued early in its development due to these digestive complaints. Gacyclidine: an experimental drug developed for neuroprotection. Memantine: treatment for Alzheimer’s disease. Methoxetamine: a novel designer drug sold on the internet. Nitromemantine: a novel memantine derivative. Nitrous oxide: used for anesthesia, particularly in dentistry. PD-137889: Potent NMDA receptor antagonist with roughly 30 times the potency of ketamine. Substitutes for PCP in animal studies. Phencyclidine: a dissociative anesthetic previously used in medicine, but its development was discontinued in the 1960s in favor of its successor ketamine due to its relatively high incidence of psychotomimetic effects. Abused recreational and legally controlled in most countries. Rolicyclidine: a less potent analogue of phencyclidine, but seems to be seldom, if ever, abused. Tenocyclidine: an analogue of phencyclidine that is more potent. Neramexane: a memantine analogue with nootropic, antidepressant properties. Also a nicotinic acetylcholine antagonist. Eliprodil: an anticonvulsant drug with neuroprotective properties. Etoxadrol: a potent dissociative similar to PCP. WMS-2539: potent fluorinated derivative of dexoxadrol. NEFA: a moderate affinity antagonist. Remacemide: a low affinity antagonist also a sodium-channel blocker. Delucemine: also a SSRI with neuroprotective properties. 8A-PDHQ: a high affinity PCP structural analogue. Aptiganel (Cerestat, CNS-1102): binds the Mg2+ binding site within the channel of the NMDA receptor. HU-211: an enantiomer of the potent cannabinoid HU-210 which lacks cannabinoid effects and instead acts as a potent non-competitive NMDA antagonist. Ibogaine: a naturally-occurring alkaloid found in plants of the Apocynaceae family. Has been used, albeit with limited evidence, to treat opioid and other addictions. Remacemide: principle metabolite is an uncompetitive antagonist with a low affinity for the binding site. Rhynchophylline an alkaloid, found in Kratom and Rubiaceae. Gabapentin: a calcium a2-d ligand that is commonly used in diabetic neuropathy. L-Phenylalanine, a naturally occurring amino acid (equilibrium dissociation constant (KB) from Schild regression is 573 µM). ^ Pender JW (February 1971). “Dissociative anesthesia”. JAMA. 215 (7): 1126–30. doi:10.1001/jama.1971.03180200050011. PMC 1518731. PMID 5107596. ^ Ceber M, Salihoglu T (2006). “Ketamine may be the first choice for anesthesia in burn patients”. Journal of Burn Care & Research. 27 (5): 760–2. doi:10.1097/01.BCR.0000238091.41737.7C. PMID 16998413. ^ Heshmati F, Zeinali MB, Noroozinia H, Abbacivash R, Mahoori A (December 2003). “Use of ketamine in severe status asthmaticus in intensive care unit”. Iranian Journal of Allergy, Asthma, and Immunology. 2 (4): 175–80. PMID 17301376. ^ Equinozzi R, Robuschi M (2006). “Comparative efficacy and tolerability of pholcodine and dextromethorphan in the management of patients with acute, non-productive cough : a randomized, double-blind, multicenter study”. Treatments in Respiratory Medicine. 5 (6): 509–13. doi:10.2165/00151829-200605060-00014. PMID 17154678. ^ Newcomer JW, Krystal JH (2001). “NMDA receptor regulation of memory and behavior in humans”. Hippocampus. 11 (5): 529–42. doi:10.1002/hipo.1069. PMID 11732706. ^ Lipina T, Labrie V, Weiner I, Roder J (April 2005). “Modulators of the glycine site on NMDA receptors, D-serine and ALX 5407, display similar beneficial effects to clozapine in mouse models of schizophrenia”. Psychopharmacology. 179 (1): 54–67. doi:10.1007/s00213-005-2210-x. PMID 15759151. ^ Erhardt S, Schwieler L, Nilsson L, Linderholm K, Engberg G (September 2007). “The kynurenic acid hypothesis of schizophrenia”. Physiology & Behavior. 92 (1–2): 203–9. doi:10.1016/j.physbeh.2007.05.025. PMID 17573079. ^ Muir KW, Lees KR (March 1995). “Clinical experience with excitatory amino acid antagonist drugs”. Stroke. 26 (3): 503–13. doi:10.1161/01.STR.26.3.503. PMID 7886734. ^ Aarts MM, Tymianski M (September 2003). “Novel treatment of excitotoxicity: targeted disruption of intracellular signalling from glutamate receptors”. Biochemical Pharmacology. 66 (6): 877–86. doi:10.1016/S0006-2952(03)00297-1. PMID 12963474. ^ a b c Kim AH, Kerchner GA, Choi DW (2002). “Blocking Excitotoxicity”. In Marcoux FW, Choi DW. CNS Neuroprotection. New York: Springer. pp. 3–36. ^ Kristensen JD, Svensson B, Gordh T (November 1992). “The NMDA-receptor antagonist CPP abolishes neurogenic ‘wind-up pain’ after intrathecal administration in humans”. Pain. 51 (2): 249–53. doi:10.1016/0304-3959(92)90266-E. PMID 1484720. ^ Rockstroh S, Emre M, Tarral A, Pokorny R (April 1996). “Effects of the novel NMDA-receptor antagonist SDZ EAA 494 on memory and attention in humans”. Psychopharmacology. 124 (3): 261–6. doi:10.1007/BF02246666. PMID 8740048. ^ Lim DK (January 2003). “Ketamine associated psychedelic effects and dependence”. Singapore Medical Journal. 44 (1): 31–4. PMID 12762561. ^ Chia YY, Liu K, Chow LH, Lee TY (September 1999). “The preoperative administration of intravenous dextromethorphan reduces postoperative morphine consumption”. Anesthesia and Analgesia. 89 (3): 748–52. doi:10.1097/00000539-199909000-00041. PMID 10475318. ^ Kharasch ED, Labroo R (December 1992). “Metabolism of ketamine stereoisomers by human liver microsomes”. Anesthesiology. 77 (6): 1201–7. doi:10.1097/00000542-199212000-00022. PMID 1466470. ^ Livingston A, Waterman AE (September 1978). “The development of tolerance to ketamine in rats and the significance of hepatic metabolism”. British Journal of Pharmacology. 64 (1): 63–9. doi:10.1111/j.1476-5381.1978.tb08641.x. PMC 1668251. PMID 698482. ^ Sun L, Li Q, Li Q, Zhang Y, Liu D, Jiang H, Pan F, Yew DT (March 2014). “Chronic ketamine exposure induces permanent impairment of brain functions in adolescent cynomolgus monkeys”. Addiction Biology. 19 (2): 185–94. doi:10.1111/adb.12004. PMID 23145560. ^ Slikker W, Zou X, Hotchkiss CE, Divine RL, Sadovova N, Twaddle NC, Doerge DR, Scallet AC, Patterson TA, Hanig JP, Paule MG, Wang C (July 2007). “Ketamine-induced neuronal cell death in the perinatal rhesus monkey”. Toxicological Sciences. 98 (1): 145–58. doi:10.1093/toxsci/kfm084. PMID 17426105. ^ Green SM, Coté CJ (August 2009). “Ketamine and neurotoxicity: clinical perspectives and implications for emergency medicine”. Annals of Emergency Medicine. 54 (2): 181–90. doi:10.1016/j.annemergmed.2008.10.003. PMID 18990467. ^ Morgan CJ, Muetzelfeldt L, Curran HV (January 2010). “Consequences of chronic ketamine self-administration upon neurocognitive function and psychological wellbeing: a 1-year longitudinal study”. Addiction. 105 (1): 121–33. doi:10.1111/j.1360-0443.2009.02761.x. PMID 19919593. ^ Olney JW, Labruyere J, Wang G, Wozniak DF, Price MT, Sesma MA (December 1991). “NMDA antagonist neurotoxicity: mechanism and prevention”. Science. 254 (5037): 1515–8. Bibcode:1991Sci…254.1515O. doi:10.1126/science.1835799. PMID 1835799. ^ a b Farber NB, Heinkel C, Dribben WH, Nemmers B, Jiang X (November 2004). “In the adult CNS, ethanol prevents rather than produces NMDA antagonist-induced neurotoxicity”. Brain Research. 1028 (1): 66–74. doi:10.1016/j.brainres.2004.08.065. PMID 15518643. ^ a b Farber NB, Jiang X, Dikranian K, Nemmers B (December 2003). “Muscimol prevents NMDA antagonist neurotoxicity by activating GABAA receptors in several brain regions”. Brain Research. 993 (1–2): 90–100. doi:10.1016/j.brainres.2003.09.002. PMID 14642834. ^ Maas AI (April 2001). “Neuroprotective agents in traumatic brain injury”. Expert Opinion on Investigational Drugs. 10 (4): 753–67. doi:10.1517/13543784.10.4.753. PMID 11281824. ^ Chen HS, Lipton SA (June 2006). “The chemical biology of clinically tolerated NMDA receptor antagonists”. Journal of Neurochemistry. 97 (6): 1611–26. doi:10.1111/j.1471-4159.2006.03991.x. PMID 16805772. ^ Gardoni F, Di Luca M (September 2006). “New targets for pharmacological intervention in the glutamatergic synapse”. European Journal of Pharmacology. 545 (1): 2–10. doi:10.1016/j.ejphar.2006.06.022. PMID 16831414. ^ Abizaid A, Liu ZW, Andrews ZB, Shanabrough M, Borok E, Elsworth JD, Roth RH, Sleeman MW, Picciotto MR, Tschöp MH, Gao XB, Horvath TL (December 2006). “Ghrelin modulates the activity and synaptic input organization of midbrain dopamine neurons while promoting appetite”. The Journal of Clinical Investigation. 116 (12): 3229–39. doi:10.1172/JCI29867. PMC 1618869. PMID 17060947. ^ van den Bos R, Charria Ortiz GA, Cools AR (June 1992). “Injections of the NMDA-antagonist D-2-amino-7-phosphonoheptanoic acid (AP-7) into the nucleus accumbens of rats enhance switching between cue-directed behaviours in a swimming test procedure”. Behavioural Brain Research. 48 (2): 165–70. doi:10.1016/S0166-4328(05)80153-6. PMID 1535501. ^ Eblen F, Löschmann PA, Wüllner U, Turski L, Klockgether T (March 1996). “Effects of 7-nitroindazole, NG-nitro-L-arginine, and D-CPPene on harmaline-induced postural tremor, N-methyl-D-aspartate-induced seizures, and lisuride-induced rotations in rats with nigral 6-hydroxydopamine lesions”. European Journal of Pharmacology. 299 (1–3): 9–16. doi:10.1016/0014-2999(95)00795-4. PMID 8901001. ^ Shultz RB, Zhong Y (May 2017). “Minocycline targets multiple secondary injury mechanisms in traumatic spinal cord injury”. Neural Regeneration Research. 12 (5): 702–713. doi:10.4103/1673-5374.206633. PMC 5461601. PMID 28616020. ^ Ludolph AG, Udvardi PT, Schaz U, Henes C, Adolph O, Weigt HU, Fegert JM, Boeckers TM, Föhr KJ (May 2010). “Atomoxetine acts as an NMDA receptor blocker in clinically relevant concentrations”. British Journal of Pharmacology. 160 (2): 283–91. doi:10.1111/j.1476-5381.2010.00707.x. PMC 2874851. PMID 20423340. ^ Wong BY, Coulter DA, Choi DW, Prince DA (February 1988). “Dextrorphan and dextromethorphan, common antitussives, are antiepileptic and antagonize N-methyl-D-aspartate in brain slices”. Neuroscience Letters. 85 (2): 261–6. doi:10.1016/0304-3940(88)90362-X. PMID 2897648. ^ Fix AS, Horn JW, Wightman KA, Johnson CA, Long GG, Storts RW, Farber N, Wozniak DF, Olney JW (October 1993). “Neuronal vacuolization and necrosis induced by the noncompetitive N-methyl-D-aspartate (NMDA) antagonist MK(+)801 (dizocilpine maleate): a light and electron microscopic evaluation of the rat retrosplenial cortex”. Experimental Neurology. 123 (2): 204–15. doi:10.1006/exnr.1993.1153. PMID 8405286. ^ Harrison NL, Simmonds MA (February 1985). “Quantitative studies on some antagonists of N-methyl D-aspartate in slices of rat cerebral cortex”. British Journal of Pharmacology. 84 (2): 381–91. doi:10.1111/j.1476-5381.1985.tb12922.x. PMC 1987274. PMID 2858237. ^ Chawla PS, Kochar MS (May 2006). “What’s new in clinical pharmacology and therapeutics”. WMJ. 105 (3): 24–9. PMID 16749321. ^ Talantova M, Sanz-Blasco S, Zhang X, Xia P, Akhtar MW, Okamoto S, Dziewczapolski G, Nakamura T, Cao G, Pratt AE, Kang YJ, Tu S, Molokanova E, McKercher SR, Hires SA, Sason H, Stouffer DG, Buczynski MW, Solomon JP, Michael S, Powers ET, Kelly JW, Roberts A, Tong G, Fang-Newmeyer T, Parker J, Holland EA, Zhang D, Nakanishi N, Chen HS, Wolosker H, Wang Y, Parsons LH, Ambasudhan R, Masliah E, Heinemann SF, Piña-Crespo JC, Lipton SA (July 2013). “Aβ induces astrocytic glutamate release, extrasynaptic NMDA receptor activation, and synaptic loss”. Proceedings of the National Academy of Sciences of the United States of America. 110 (27): E2518–27. Bibcode:2013PNAS..110E2518T. doi:10.1073/pnas.1306832110. PMC 3704025. PMID 23776240. ^ Grasshoff C, Drexler B, Rudolph U, Antkowiak B (2006). “Anaesthetic drugs: linking molecular actions to clinical effects”. Current Pharmaceutical Design. 12 (28): 3665–79. doi:10.2174/138161206778522038. PMID 17073666. ^ Ko JC, Smith TA, Kuo WC, Nicklin CF (1998). “Comparison of anesthetic and cardiorespiratory effects of diazepam-butorphanol-ketamine, acepromazine-butorphanol-ketamine, and xylazine-butorphanol-ketamine in ferrets”. Journal of the American Animal Hospital Association. 34 (5): 407–16. doi:10.5326/15473317-34-5-407. PMID 9728472. ^ Banerjee A, Schepmann D, Köhler J, Würthwein EU, Wünsch B (November 2010). “Synthesis and SAR studies of chiral non-racemic dexoxadrol analogues as uncompetitive NMDA receptor antagonists”. Bioorganic & Medicinal Chemistry. 18 (22): 7855–67. doi:10.1016/j.bmc.2010.09.047. PMID 20965735. ^ Nadler V, Mechoulam R, Sokolovsky M (November 1993). “The non-psychotropic cannabinoid (+)-(3S,4S)-7-hydroxy-delta 6- tetrahydrocannabinol 1,1-dimethylheptyl (HU-211) attenuates N-methyl-D-aspartate receptor-mediated neurotoxicity in primary cultures of rat forebrain”. Neuroscience Letters. 162 (1–2): 43–5. doi:10.1016/0304-3940(93)90555-Y. PMID 8121633. ^ Zhang JM, Hu GY (2001). “Huperzine A, a nootropic alkaloid, inhibits N-methyl-D-aspartate-induced current in rat dissociated hippocampal neurons”. Neuroscience. 105 (3): 663–9. doi:10.1016/s0306-4522(01)00206-8. PMID 11516831. ^ Qian ZM, Ke Y (2014). “Huperzine A: Is it an Effective Disease-Modifying Drug for Alzheimer’s Disease?”. Frontiers in Aging Neuroscience. 6: 216. doi:10.3389/fnagi.2014.00216. PMC 4137276. PMID 25191267. ^ Coleman BR, Ratcliffe RH, Oguntayo SA, Shi X, Doctor BP, Gordon RK, Nambiar MP (September 2008). “[+]-Huperzine A treatment protects against N-methyl-D-aspartate-induced seizure/status epilepticus in rats”. Chemico-Biological Interactions. 175 (1–3): 387–95. doi:10.1016/j.cbi.2008.05.023. PMID 18588864. ^ Popik P, Layer RT, Skolnick P (May 1994). “The putative anti-addictive drug ibogaine is a competitive inhibitor of [3H]MK-801 binding to the NMDA receptor complex”. Psychopharmacology. 114 (4): 672–4. doi:10.1007/BF02245000. PMID 7531855. ^ Brown TK (March 2013). “Ibogaine in the treatment of substance dependence”. Current Drug Abuse Reviews. 6 (1): 3–16. doi:10.2174/15672050113109990001. PMID 23627782. ^ Muir KW (February 2006). “Glutamate-based therapeutic approaches: clinical trials with NMDA antagonists”. Current Opinion in Pharmacology. 6 (1): 53–60. doi:10.1016/j.coph.2005.12.002. PMID 16359918. ^ Hara K, Sata T (January 2007). “Inhibitory effect of gabapentin on N-methyl-D-aspartate receptors expressed in Xenopus oocytes”. Acta Anaesthesiologica Scandinavica. 51 (1): 122–8. doi:10.1111/j.1399-6576.2006.01183.x. PMID 17073851. ^ Hartley DM, Monyer H, Colamarino SA, Choi DW (1990). “7-Chlorokynurenate Blocks NMDA Receptor-Mediated Neurotoxicity in Murine Cortical Culture”. The European Journal of Neuroscience. 2 (4): 291–295. doi:10.1111/j.1460-9568.1990.tb00420.x. PMID 12106035. ^ Frankiewicz T, Pilc A, Parsons CG (February 2000). “Differential effects of NMDA-receptor antagonists on long-term potentiation and hypoxic/hypoglycaemic excitotoxicity in hippocampal slices”. Neuropharmacology. 39 (4): 631–42. doi:10.1016/S0028-3908(99)00168-9. PMID 10728884. ^ Khan MJ, Seidman MD, Quirk WS, Shivapuja BG (2000). “Effects of kynurenic acid as a glutamate receptor antagonist in the guinea pig”. European Archives of Oto-Rhino-Laryngology. 257 (4): 177–81. doi:10.1007/s004050050218. PMID 10867830. ^ Kvist T, Steffensen TB, Greenwood JR, Mehrzad Tabrizi F, Hansen KB, Gajhede M, Pickering DS, Traynelis SF, Kastrup JS, Bräuner-Osborne H (November 2013). “Crystal structure and pharmacological characterization of a novel N-methyl-D-aspartate (NMDA) receptor antagonist at the GluN1 glycine binding site”. The Journal of Biological Chemistry. 288 (46): 33124–35. doi:10.1074/jbc.M113.480210. PMC 3829161. PMID 24072709. ^ Glushakov AV, Dennis DM, Morey TE, Sumners C, Cucchiara RF, Seubert CN, Martynyuk AE (2002). “Specific inhibition of N-methyl-D-aspartate receptor function in rat hippocampal neurons by L-phenylalanine at concentrations observed during phenylketonuria”. Molecular Psychiatry. 7 (4): 359–67. doi:10.1038/sj.mp.4000976. PMID 11986979. ^ Glushakov AV, Glushakova O, Varshney M, Bajpai LK, Sumners C, Laipis PJ, Embury JE, Baker SP, Otero DH, Dennis DM, Seubert CN, Martynyuk AE (February 2005). “Long-term changes in glutamatergic synaptic transmission in phenylketonuria”. Brain. 128 (Pt 2): 300–7. doi:10.1093/brain/awh354. PMID 15634735. ^ Banks P, Franks NP, Dickinson R (March 2010). “Competitive inhibition at the glycine site of the N-methyl-D-aspartate receptor mediates xenon neuroprotection against hypoxia-ischemia”. Anesthesiology. 112 (3): 614–22. doi:10.1097/ALN.0b013e3181cea398. PMID 20124979. ^ Wallach J, Kang H, Colestock T, Morris H, Bortolotto ZA, Collingridge GL, Lodge D, Halberstadt AL, Brandt SD, Adejare A (2016). “Pharmacological Investigations of the Dissociative ‘Legal Highs’ Diphenidine, Methoxphenidine and Analogues”. PLOS One. 11 (6): e0157021. Bibcode:2016PLoSO..1157021W. doi:10.1371/journal.pone.0157021. PMC 4912077. PMID 27314670.